Elsie S. Reiter , 94, formerly of Maple Crest in Port Washington, died Sunday, January 15, 2012 at Grand Horizon West in Appleton, Wisconsin. 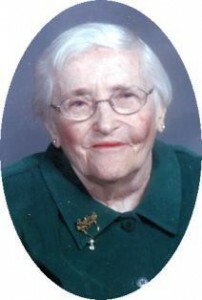 She was born May 4, 1917 in Fredonia, Wisconsin to John and Margaret Binsfeld Burmesch. She grew up on the family farm near Holy Cross in the Town of Belgium. She married Greg Weyker of Port Washington on September 4, 1940 at St. Mary’s Church in Port Washington, he preceded her in death July 1, 1965. She married William Reiter of Port Washington on June 3, 1968 in Chicago, he preceded her in death in 1983. Through the years Elsie lived on N Milwaukee Street in Port Washington and moved to the Maple Crest apartments in Port Washington in 1997. She worked as a nurses aide for the former St. Alphonsus Hospital in Port Washingtion until her retirement in 1990 at the age of 73. She enjoyed playing piano and crocheting. She is survived by her children Suzanne (Thomas) Consolo of Appleton, Rosemary (George) Kobylinski of Sheboygan, Donna (Matt) Smith of St. Charles, Louisianna, Greg (Angela) Weyker of Murfreesboro, Tennessee and James Weyker of St. Charles, Louisianna. Further survived by 9 grandchildren, 12 great grandchildren, 2 great great grandchildren, sisters Leona Anzia and Verena (Bert) Wester both of Port Washington, sisters-in-law Clara Weyker of Dacada and Mary Poul of Port Washington. The Rev. Thomas Lijewski will celebrate Mass of Christian Burial 2 pm Friday, January 20, 2012 at St. Mary’s Church, 430 N. Johnson Street, Port Washington. Interment parish cemetery. Visitation 12 NOON – 2 pm Friday AT CHURCH. Memorials to the American Diabetes Association, American Cancer Society or charity of choice appreciated.